The global ultrasound devices market features a high level of consolidation and dominance by few large companies. In 2014, the top three companies in the market, namely GE Healthcare, Fujifilm Holdings Corporation, and Koninklijke Philips N.V., held over 67% of the overall market, observes a recent report by Transparency Market Research. Growth and development of businesses is largely dependent on long-term contracts with key end users and the pace of development of innovative, more efficient product varieties. Along with the challenge of finding a footing amid the intense competition, typical of consolidated marketplaces, the high initial funds required to foray into a technologically advanced field like medical imaging have also limited the number of new entrants in the market. The market is likely to remain tough for new entrants in the next few years as well. Nevertheless, the vast untapped growth opportunities in emerging economies could provide sustainable environment for new ventures. Transparency Market Research states that the global ultrasound devices market exhibit a healthy growth rate over the period between 2016 and 2024 and expand from a valuation of US$7.0 bn in 2015 to US$11 bn by 2023. In terms of technology, the 2D ultrasound technology is presently the most popular and accounts for the most significant share in the overall revenues of the global ultrasound devices market. The high penetration rate of these devices, chiefly owing to their economic prices and easy availability, will continue to keep their market lucrative in the next few years as well. However, the segment of 3D/4D ultrasound devices will expand at the most significant pace owing to their higher efficiency as compared to 2D devices. 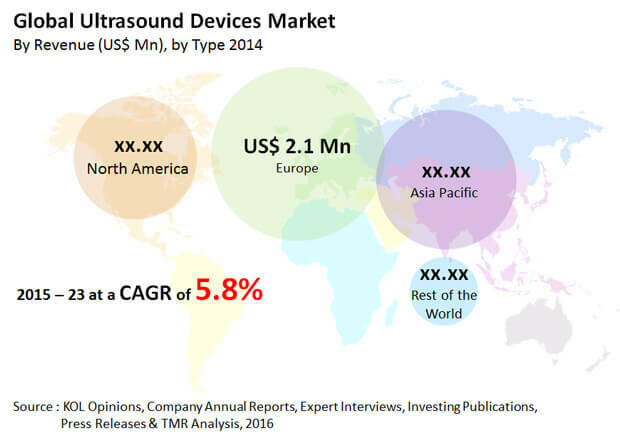 In terms of geography, Europe is the leading contributor to the revenue of the global ultrasound devices market. The region will retain its dominance, but will lose to Asia Pacific in terms of incremental growth opportunities over the forecast period. It is estimated that the global market for ultrasound device will be chiefly driven by the rising incidence of target diseases and the rapidly rising population of geriatrics across the globe. The World Health Organization (WHO) states that from around 10 mn every year around the globe in the present times, the number of deaths resulting from cardiovascular disease is likely to surpass 23 mn by 2030. Also, global geriatric population is expected to rise to nearly 2 bn by 2050 from about 809 mn in 2012. As geriatrics are more susceptible to a number of ailments, the alarming rate at which the world’s population is ageing will lead to the increased demand for advanced diagnostic technologies and devices. This will, in turn, be a key factor fueling the demand for ultrasound devices on a global front. In developed regions such as Europe and North America, the market for ultrasound devices is highly saturated. Moreover, the rate of adoption of other high-end diagnosis tools and equipment such as PET/CT scanners, MRI scanners, and SPECT/CT scanners is high. The high efficiency and rapid diagnosis offered by these alternatives presents a huge hurdle for the adoption of traditional ultrasound devices. However, the impact of this restraint is weaker in developing economies such as India, wherein the high base cost of such high-end imaging devices and the costly imaging through them compel the increased use of the much economic ultrasound devices.